You are here: Home / Den Talk / Reliable, durable, dedicated are all words that describe Angus Reid. Reliable, durable, dedicated are all words that describe Angus Reid. We all knew this day was coming and Angus Reid knew it too. The anchor of the Lions offence announced his retirement Friday from professional football after 13 seasons. Back issues last season prevented him from being anything more than a player coach for his team-mates and a mentor to his heir apparent, Matt Norman. Off-season back surgery was performed not so much so that he could play again, but so that he could lead a less painful life after football and he has one more surgery to go. Just finished at X-ray clinic. Prepping for LONG overdue shoulder surgery end of this month. My 9th and hopefully final football surgery. But pain and punishment never stopped Reid in his pursuit of his football dreams. As an undersized player he had to make people notice and he did that by making sure no one outworked him. He used his football smarts, dedication and experience to carve out a career that should lead him to the Canadian Football Hall of Fame in short order. In 2008 Angus “blew up” his foot in Edmonton and with multiple breaks played two quarters through the pain. He’s posted pictures of bone chips the size of quarters taken out of his elbows and there are countless other injuries I’m sure most will never know about. Last year herniated discs in his back simply shut him down, as it would to anyone who has ever experienced debilitating back pain. Reid was also the consummate team player which was proved in 2010 when he was told he would be the backup to Dean Valli heading into training camp. Unlike many veteran players Angus used that demotion to fuel him. He accepted the decision and set out to prove the team wrong by winning his job back and he did in short order. He then went on the following year to have an all-star season and help the Lions win another Grey Cup, the 2nd of his career. I’ve attended countless practices where Reid could be seen talking to younger linemen, teaching them his tricks of the trade. As a home grown BC Lion, Reid was extremely active in the community and the whole province. He visits schools and hospitals regularly and attends a lot of team sponsored events. There is little doubt that Reid will continue to have a role with the club as ambassador, just don’t expect him to be involved as a coach, at least not yet. As Reid told us on the BCLionsDen.ca Pawdcast last season, he may need to get away from football for a little while. He said he would love to be involved with coaching kids at some point. Of course Reid has other opportunities as well. He runs a shirt printing business, and will likely have offers to get involved in the media either locally or maybe TSN will come calling. There is little doubt fans, players coaches and anyone who has had the chance to meet him are richer as well. 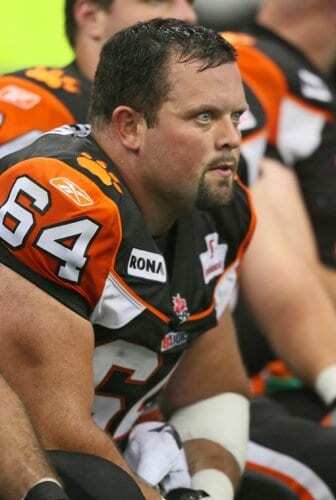 All the best Angus, and thanks for being a huge part of the BC Lions for 13 years. There is little doubt you are an important part of BC Lions history and will have a lot to contribute in the future as well. The Ring of Honour and Hall of Fame await for a player that personified what a football player is all about.